12 Pack of Premium Compatible EPSON T1285 inks. 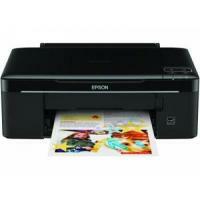 Epson Stylus SX130 is a basic multifunctional home printer. The device offers decent quality outputs for printing and scanning. The low-cost printer also offers a great saving on its running cost with its four-ink technology. It also features USB connectivity and does not offer any of the advanced technologies like wireless connectivity that many of its competitors offer. Epson Stylus SX130 is a small and compact device that weighs approximately 3.9kg. The printer has a CIS scanner and a simple and basic control panel at its top right corner. It has one paper input tray with 100-sheet storage capacity. The printer uses high-quality Epson Stylus SX130 ink cartridges that produce decent prints and last longer with printer’s individual ink system. Epson Stylus SX130 is a simple, small and basic multifunctional printer. It offers USB connectivity and scanning feature. This low-cost printer is a great option for monochrome printing use, home printing, and for college students. However, the printer lacks advanced and attractive features like WiFi, ADF, duplex printing etc. that many of its competitors offer in almost same price range. The printer also has a slow speed and comparatively low (sometimes fading) print quality that might disappoint many of the small office users. Epson T1285 multipack; 4 colours. How to fix print quality issues in an Epson Stylus SX130 printer? Faded printouts, missing colours and lines on a printout are some common issues that occur with many of the printers. The EPSON SX130 is also one of these printers that might show some print issues with time. These issues are typically caused either due to low or empty EPSON SX130 ink cartridges or clogged printhead nozzles. This is the first and basic step to get rid of printing issues. Following these simple steps will help you identify whether the printhead nozzles are clogged or the EPSON SX130 ink cartridges are low or out of ink. If these steps do not help, then replacing the cartridges would surely resolve the printing issues. Once the process is completed, make a test print on the paper you inserted earlier. If the print issue is not resolved, run the head cleaning process again. If still the print quality is not satisfying, we would recommend you to contact Epson support. Q. I’ve been using EPSON printer for my basic home use. Suddenly the status monitor reports a “Communication error” message. What should I do now? Is there any fault in EPSON SX130 ink cartridges? Please advice. Check that the power to the printer is on. Try a different cable, if the problem is still there. Check that you are using the correct printer driver for the operating system. Check the correct printer is selected in the printer's Properties. Q. I bought a couple of huge multipacks of EPSON SX130 ink cartridges in advance, for all the printers in my department at work. A few are remaining, which I need to store properly. Could you please tell me the right way to store them, so that I can use them later? Please make sure that when you store them, they remain unopened in their packaging and keep them in a sealed bag. Place them in a cooler temperature away from dust and sunlight. Also, keep the cartridges standing in the upright position all the time as it prevents mixing of ink of all the cartridges. Please try to use EPSON SX130 ink cartridges within a year from the date of manufacture. Q. Does the printer include advanced features like duplex printing, WiFi, ADF etc? A. Unfortunately, the printer does not support these advanced features. Q. Are EPSON SX 130 ink cartridges good at printing coloured printouts? A. Yes, these ink cartridges yield superior quality coloured printouts as they are designed to meet the highest standards of excellence. They create laser sharp graphics and text on plain sheets as well as glossy media and ensure they do not blur or bleed. Q. Do you offer next day delivery facility of ink cartridges if there’s an urgent requirement? A. We are equipped to execute the delivery of products in 1-3 days. Approximately 90% of our orders that are received before 12 noon are despatched on same day (subject to availability of the concerned product and absence of glitches during transportation that are beyond control). Q. Can I choose my own colours in a pack of 12 EPSON SX 130 ink cartridges? A. Yes, you can choose your own colours while buying a multipack of 12 ink cartridges by just entering your preferred combination of colours in the blank field provided. Q. Will the warranty of my EPSON SX130 printer gets void if I use compatible ink cartridges? A. No, your printer warranty will remain valid with the installation of compatible ink cartridges. You can begin using compatible cartridges in your printer and save considerably and also get the same quality output that genuine cartridges give. A. Yes, these ink cartridges are compatible with the Office BX305F printer. You can install them in this printer and be sure of getting best quality output. Q. Do you carry out the entire process of manufacturing of EPSON SX130 ink cartridges yourself before packing them? Are they considered as new or used ones? A. No, we do not manufacture compatible cartridges by ourselves. It is done by a third party manufacturers who do it professionally. The Compatible cartridges supplied on this site are brand new cartridges that are refilled my professionals and are tested to highest quality standards. Q. If one of the colour Epson SX130 ink cartridges runs out, do you have to change all of them even if the others still have ink? A. This printer has 4 separate inks, magenta, cyan, yellow and black. If one colour runs out then you just have to replace that individual colour not all the Epson SX130 ink cartridges. It is a good cost effective option. Q. Is the Epson SX130 printer compatible with windows 7? A. Yes. It works fine with windows 7. Q. Does the Epson SX130 printer has an automatic document feeder? A. No, the printer does not have ADF. You have to separate the templates manually. Q. Is the T1291 black cartridge supported in an Epson SX130 printer? A. No, it is not supported. The Epson SX130 printer can only use a black T1281 ink cartridge. Your printer can not accept high capacity cartridges such as Epson T1291. Q. Although the Epson SX130 printer sounds like it is printing, but there is no ink on the paper. How to get rid of this problem? A. There are chances that the print head nozzles are clogged. So clean the printheads by performing a head cleaning from the Utility section which is found in the Epson printer driver. Follow the process by printing a nozzle check pattern. A head cleaning and nozzle check should be performed as a loop. After printing a nozzle check, check carefully the printed dot pattern to find if there is any improvement. Each staggered horizontal and straight vertical lines should be complete, with no gaps in the dot pattern. If there are gaps then continue with another loop. Perform up to four cycles if required. If the nozzle check is not printing completely, try to replace the Epson SX130 ink cartridges. You can also turn the printer off and wait overnight as this will allow any dried ink to get soft and then try to clean the print head again. If nothing helps, then try replacing the ink cartridges or your printer may require service. In that case you should contact Epson technical support for further assistance. Q. I have purchased an Epson Stylus SX130 second hand, what cartridges should I buy and what is a compatible ink cartridge? A. The Epson Stylus SX130 ink is available both as the original Epson ink and as a compatible ink cartridge. The original ink cartridge is manufactured by Epson and the compatible ink is manufactured by a third-party manufacturer that is not Epson. The compatible Epson Stylus SX130 ink will work fine in your printer for a fraction of the cost of the original Epson ink. We recommend you buy a compatible Epson T1285 multipack that consists of the four colours T1281 black, T1282 cyan, T1283 magenta and T1284 yellow. There are various packs available for this printer depending on how much printing you intend to do. Q. I have installed a black T1281 cartridge in my printer and it says the cartridge is not recognised, what can I do to get it working? A. I assume the ink cartridge you have inserted is a compatible one and that is the reason for the printer not recognising the cartridge. Simply remove the ink cartridge, check that the yellow seal has been removed, if not remove and then re-insert the cartridge. If the seal has been removed then gently wipe the 'chip' area of the cartridge with a soft dry cloth to remove any static that may be present and re-insert the cartridge. If the cartridge fails to be recognised it's possible the cartridge is faulty and you should replace with another black cartridge. Q. I am getting poor quality prints from my cartridges that I purchased from you, do I need to order replacement cartridges? A. It's possible that there may be an issue with the print heads in your printer. In the first instance you will need to carry out a head cleaning procedure to see if this helps. This can be accessed from the properties>maintenance>head cleaning. Please print out a test sheet before and after the head cleaning to see the difference and improvement in print quality. Q. How many ink cartridges would the EPSON SX 130 printer require? A. The Epson Stylus SX130 printer requires four individual ink cartridges in four separate colours that are: black, cyan, magenta and yellow. It is not mandatory to replace all cartridges at one time. You can replace only the EPSON SX 130 ink cartridge which runs out of ink. Our site offers ink cartridges where you can order single as well as multipacks of the cartridges. Q.What is the capacity of EPSON SX130 ink cartridges? A. All colours have different capacity. The black EPSON SX130 ink cartridges contains 5.9ml of ink while cyan, magenta and yellow cartridges contain 3.5ml each. Q. When I try to print from my laptop, the printer EPSON SX130 is not in the list. Is the printer broken? A. No, It’s not necessary. There is a possibility of printer not correctly installed or the USB port not connected. To ensure that the document will print make sure the printer is installed on the device. This can be viewed in 'computer's devices', press install. If the printer is already installed then check USB connection to see if the port is working or not. If the problem is still not rectified contact Epson for further help. Q. The Efficiency of my printer has gone down since a week. Is my ink exhausted? How would I get to know? A. This is not necessary. The quality deterioration doesn’t always signify exhaustion of ink. There might be a blocked head as well. Try performing head cleaning procedure with your printer first to ensure that there is no blocked head. For cleaning the blocked head consult the user manual. If the problem still persists then change the cartridges. Q. My printer ran out of yellow ink and other inks are not exhausted. I am still unable to print. Is my printer damaged? A. No, your printer is fine. Epson stops printing even at exhaustion of one colour to prevent damage of the printer. To start printing again, change the yellow cartridge by yellow Epson SX130 ink cartridge. You can buy the same from our website. When you change the ink the printer will resume to print. Q. I wish to buy Black EPSON SX 130 ink cartridge. Should I buy multipack or single pack? A. Usually, the ink cartridges are available in multipacks as well as in individual colours. You have the option to purchase single ink cartridges as well as multi packs. Single packs are suitable when you need only one single colour. Whereas, multipacks provide you all colours at a cheaper rate. Since you need only black cartridge you can go for buying single pack. Q. I am planning to buy EPSON SX 130 printer for my home. How many cartridges does this printer use? A. This printer has 4 colour slots. It supports black, magenta, cyan and yellow colours. The printer has individual slots marked with the colour’s respective place where cartridge is to be placed in. The multipack of EPSON SX 130 ink cartridge provides all 4 colours which need to be placed in respective colour slots. Q. Can I print on photo paper using Epson SX130 printer? I am concerned about short photo life? A. The printer is a great option for printing photos in comfort of home at an affordable cost. SX 130 supports printing on photo paper or glossy paper. The ink of Epson SX130 ink cartridge gives lively and bright colours making the photo look good. The ink doesn't wear off or fade away providing decent shelf life of photos.